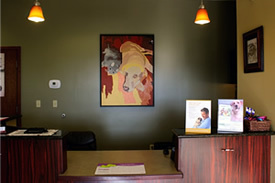 Willowbend Animal Hospital has a strong commitment to the oral health of our patients. 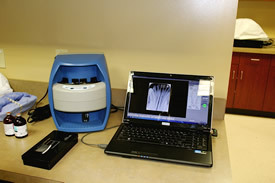 Our dental suite is equipped with digital dental x-rays, a scaling/polishing unit, and instruments for extractions. 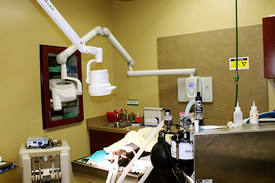 All oral COHATS (comprehensive oral health assessment and treatment) are done under general anesthesia, with the patient receiving intravenous fluids. We monitor vital parameters, including blood pressure, heart and respiratory rate, pulse oximeter and an ECG while the patient is anesthetized. 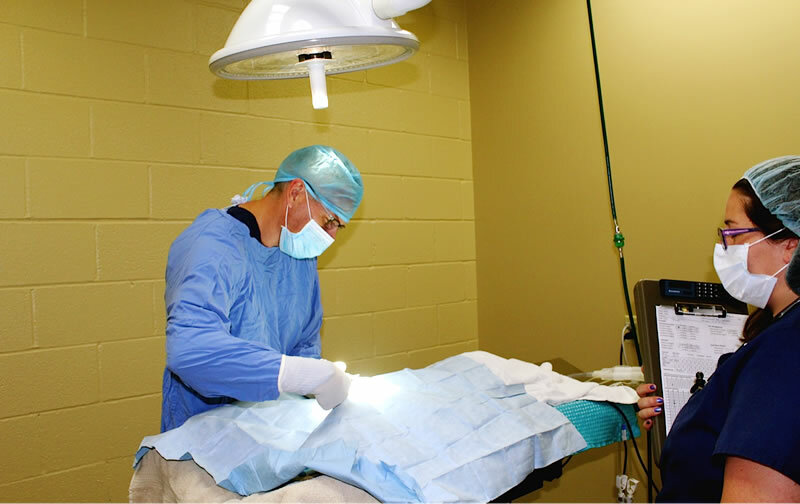 If a tooth needs to be extracted, a nerve block is performed and injectable pain medications are given both prior to and after the procedure and the patient is sent home on pain medication. Keeping your pet comfortable is always our number one priority. 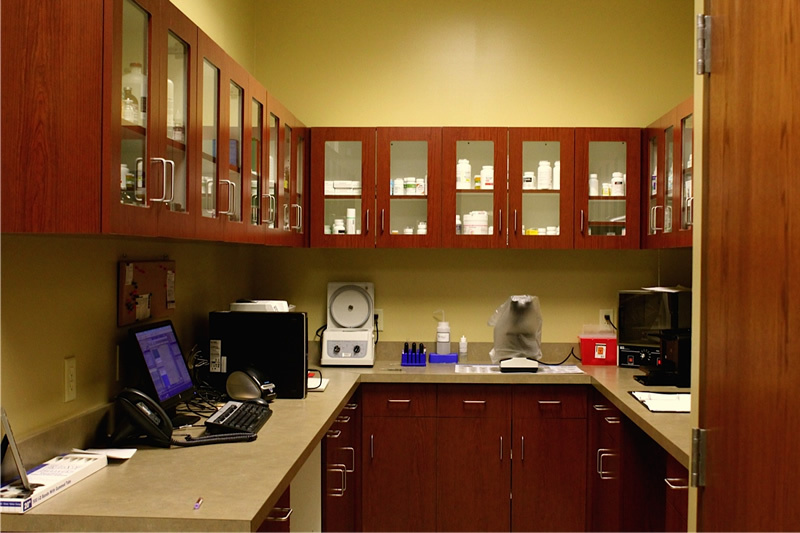 Our surgery suite was designed to provide an optimal operating environment. The suite has separate ventilation from the rest of the hospital, a central oxygen line, and a pass-through window to minimize traffic flow into and out of the suite. 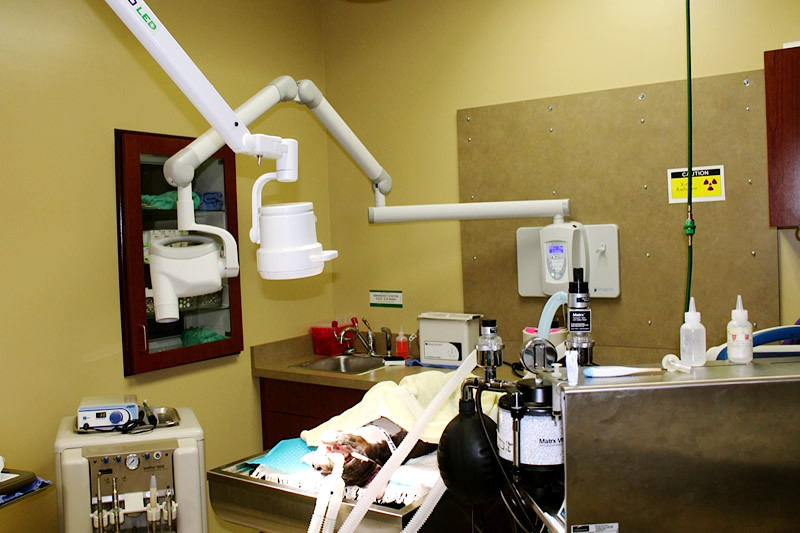 When a patient is under anesthesia, he/she is monitored closely by a highly trained, experienced assistant utilizing anesthetic patient equipment monitors. Every patient’s vital signs- including heart rate, respiratory rate, body temperature, blood pressure, and blood oxygen saturation are charted every 5 minutes. Body temperature is charted every 15 minutes. 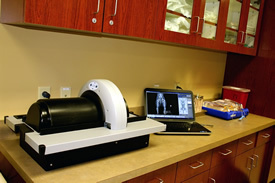 Our x-ray machine utilizes advanced CR digital technology to provide high-quality, diagnostic x-rays. 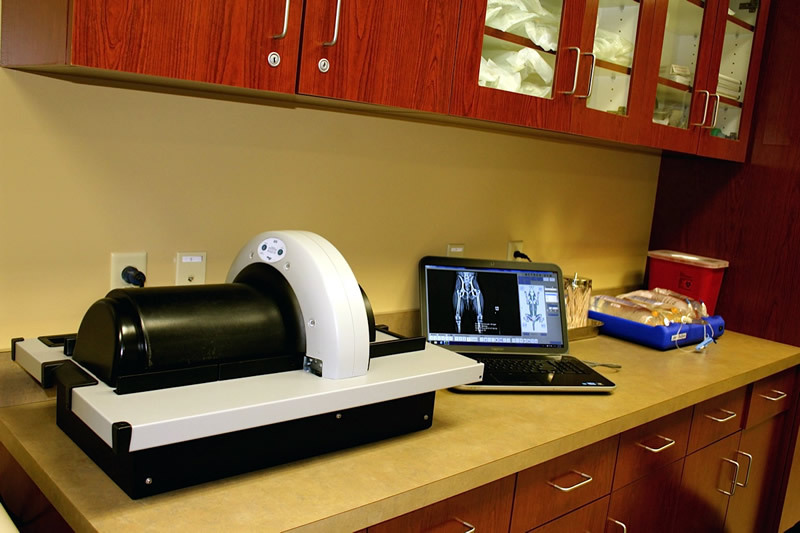 Our radiographs are emailed to a board certified radiologist, providing an expert opinion within 24 hours. The radiology suite was designed to allow radiographs to be taken on an anesthetized pet via connection with a central oxygen line. 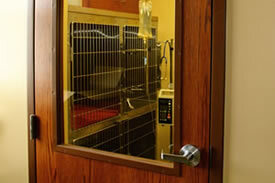 Our “Buster ICU cage” allows a cat or a small to medium size dog to comfortably rest in an oxygen-rich environment. Providing such an environment is crucial for a dog in congestive heart failure or a cat with an emergency asthma attack. Traditional methods of trying to supply oxygen to a critical patient often result in excessive anxiety for the patient and can be counter-productive. The Buster cage eliminates this, as the patient can rest quietly, in a padded, secluded “den” while receiving life-saving oxygen. 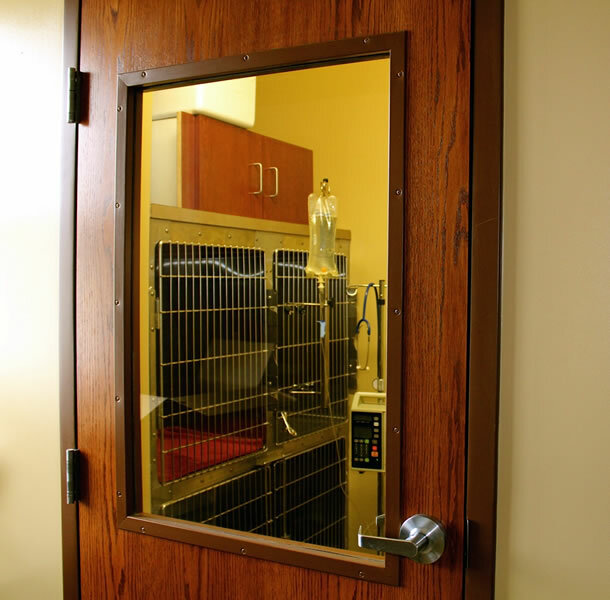 The isolation ward is critical for pets with potentially infectious disease that need to be hospitalized. The ward has separate ventilation from the rest of the hospital, protecting the rest of the pets in the hospital. 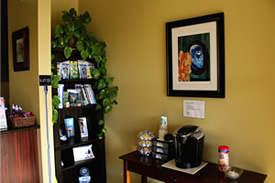 In addition, the ward is secluded and quiet, providing a stress-free environment. 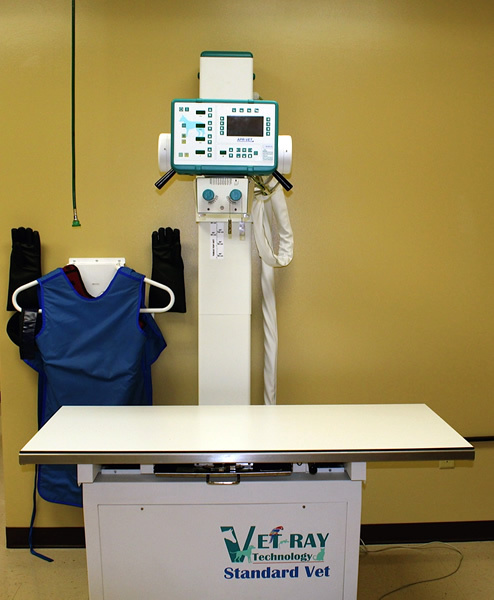 The ward is fully stocked with equipment needed to hospitalize a pet. All personal entering the ward are required to wear protective equipment- a mask, glove and clean gown in order to minimize contamination from the isolation ward. The patient reception area provides the first impression when entering the clinic. The area was designed to be pleasing and warm. The placement of the reception desk means you will be greeted immediately with a smile when entering the clinic. 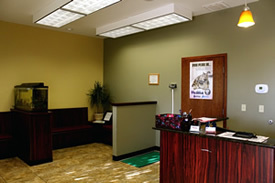 The waiting area is divided by a fish tank into a dog waiting area and a cat waiting area. The fish tank, a flat-panel TV and overhead music serve to make your wait time as pleasant as possible. 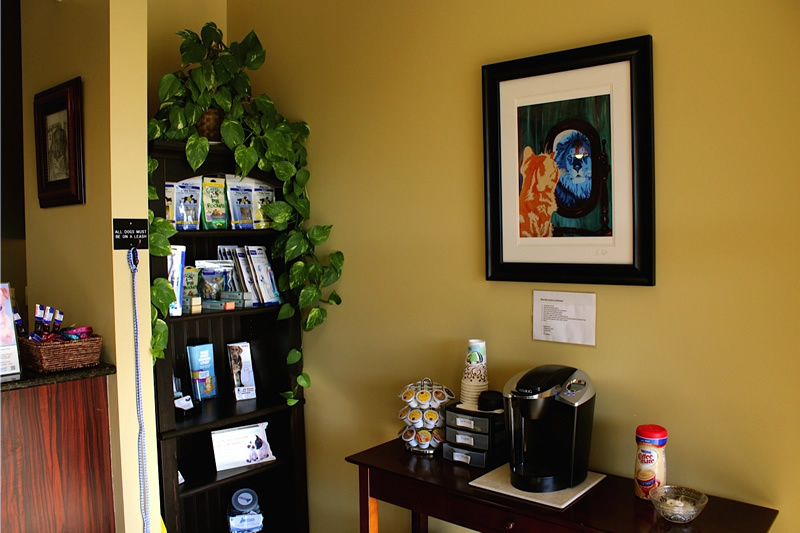 We offer coffee, tea and mints as refreshments to enjoy during your visit. 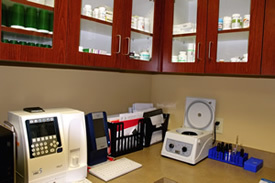 Our pharmacy is fully stocked to provide prescription and non-prescription medications for the convenience of our clients. Our in-house laboratory consists of state-of-the art equipment that enables blood work results when we need answers right away. 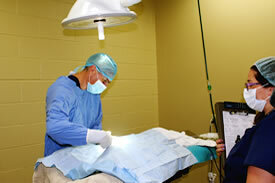 For less urgent cases, we send our lab samples to a veterinary reference lab and will have results within 24 hours.